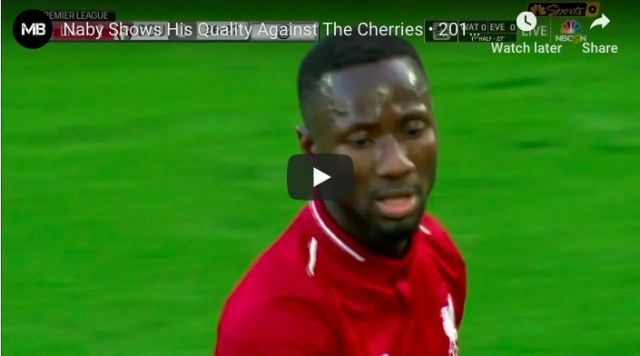 Naby Keita was one of our best players against Bournemouth on Saturday. The Guinean was involved in all three goals and put in arguably his most impressive performance since signing for Liverpool last summer. Jurgen Klopp gave the midfielder, who turned 24 yesterday, his fourth consecutive start in the Premier League – and was adequately rewarded. It feels like Keita has found a position that suits him in the side; part of a flexible midfield three that allows him to pick up the ball in deep positions and roam forward with it or pass through the lines. It’s what saw him rated so highly at Rb Leipzig and we’re beginning to see more than glimpses of his undeniable potential. Hopefully, Keita can maintain the level he found in the second-half v West Ham and for the entirety of the Bournemouth clash.